Many parents of newborns are terrified of fevers in their babies. Some of that fear is because of the medical profession: we are quick to tell parents to call us if their children have fevers, especially newborns. So when should you worry about a fever? And what should you do if your newborn or infant spikes a fever? First of all, when I’m on call and a parent calls about their child’s temperature, the first thing I want to know is how was the temperature taken. For newborns and infants, a rectal temperature is the most accurate. If you are reluctant to take the temperature this way, use an ear thermometer. These are also usually accurate. Axillary temperatures (taken under the arm) are not usually accurate, so I ask that the parent take the temperature in another way. Likewise, forehead scanners are usually not that accurate, though, admittedly, the technology is getting better. And simply placing your hand on a child does not tell us much about her temperature. This may tell you she feels warm or hot, but then take her temperature to get an more precise reading. A good guide to how to take your baby’s temperature can be found here. What’s A Normal Temperature and What’s A Fever? Babies are no different than adults when it comes to normal temperature, so they should be 98.6° Fahrenheit on average. However, no one is ALWAYS 98.6°, so there is a range of temperatures that is considered normal: any temperature from 97.6 to 99.6 is considered normal (the normal range is 37° Celsius, plus or minus 0.6°). 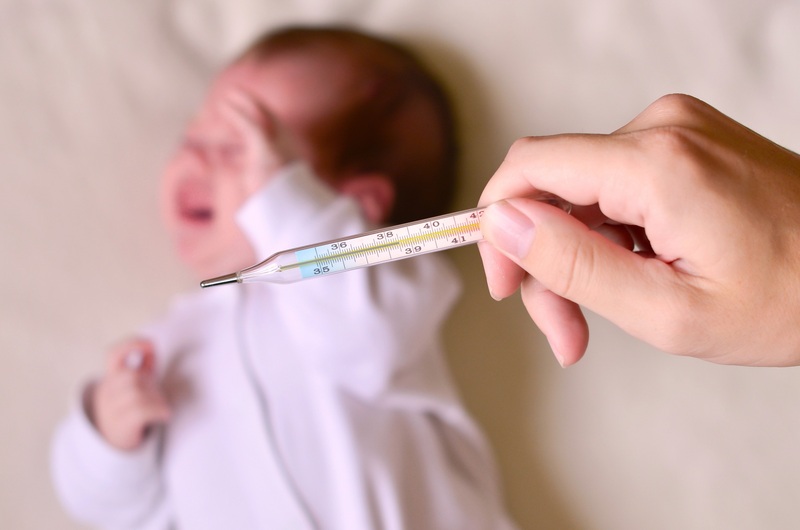 The definition of “fever” varies but is generally considered to be 100.5° F (38° Celsius) or higher.1 This should be a rectal temperature in babies or infants. So Is A Fever Dangerous? Fever is usually a sign that your body is fighting an infection. This means that your body is doing what it’s supposed to be doing, so in that sense, a fever is good news. The bad news is that it often makes you feel uncomfortable, or in some cases, miserable. The fever, by itself, is almost never dangerous. Your body temperature needs to get as high as 106-107° F to cause any true damage, and this almost never happens with a fever. This only happens from external causes, such as being trapped in a hot car with the windows rolled up on a very hot day, or being in a building on fire. These situations happen all the time, and then your body will experience heat stroke. But that won’t happen from a fever. One thing that can happen with a fever is a febrile seizure. This is most common in children from the age of 6 months to 6 years old. It is thought that the rapid rise of the fever, rather than the height of the fever, is the cause of a febrile seizure. So fevers that come rise quickly to 102° F may be more likely to cause a seizure than a fever that is actually higher, such as 104° or 105° F.
The other problem with a fever is that is means you have an infection. For babies and infants, this can be something as benign as a common cold or something much more serious and even life threatening. For infants 3 months old or less, call your doctor if your child has a fever. Little babies sometimes don’t “act” sick at first when they have a serious infection, and it’s important to talk to a medical professional in these cases before giving any fever medicine. For older children, you can always call your doctor, but look at the child first: if she is comfortable and not in any distress, and there is an obvious reason for the fever (cough and cold symptoms), then you don’t necessarily need to treat with a fever reducer. The fever is doing its job. Save the fever reducer for when the fever is making your child uncomfortable. And if you do give a fever reducer, never use aspirin, as this can cause a serious problem in children known as Reye’s syndrome. When to call the pediatrician.